Today at CES 2013, Qualcomm revealed their new series of processors, Snapdragon 600 series & Snapdragon 800 series. The Snapdragon 800 will provide users with high-speed LTE connectivity, with enhanced Wifi standards and a Quad-core architecture that can operate as fast as 2.3 Ghz. Wow! Its also capable of playing 4K resolution video, and record it as well. Now, with a processor this powerful the battery consumption will be really high... Right?? Wrong!! Qualcomm claims that the 800 will be consume only half of the power consumed by Snapdragon S4 processors. 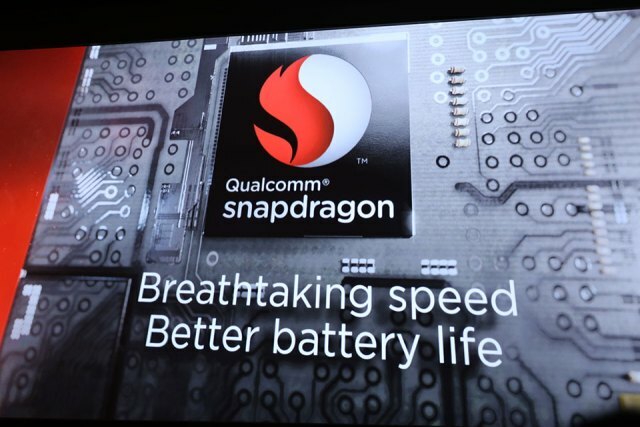 Snapdragon 800 also features an Adreno 330 GPU, based on Krait 400 cores. Talking about Snapdragon 600 series, it will also have a Quad-core architecture which can operate upto 1.9 Ghz. It will feature an Adreno 320 GPU, based on Krait 300 cores. We will be experiencing smartphones powered with Snapdragon 600 & 800 processors by second half of this year competing against Nvidia's Tegra 4 Processor. LAS VEGAS – January 7, 2013 – Qualcomm Incorporated (NASDAQ: QCOM) today announced that its wholly owned subsidiary, Qualcomm Technologies, Inc., is sampling the first products in its latest generation of processors. With the introduction of its newest Qualcomm Snapdragon™ 800 and 600 processors, Qualcomm continues to lead the industry by once again raising the bar on performance per watt and delivering unparalleled user experiences. - Visually stunning mobile experiences: Qualcomm Snapdragon 800 processors include the new quad core Krait 400 CPU, Adreno™ 330 GPU, Hexagon v5 DSP and our latest 4G LTE Cat 4 modem and deliver increased system performance and platform upgrades that further enhance user experience. - Seamless communications anytime, anywhere: Qualcomm Snapdragon 800 processors offer fully integrated connectivity and a wide variety of communication options. Breakthrough multimedia experiences: The Qualcomm Snapdragon 800 processors also introduce the very latest mobile experiences. The Qualcomm Snapdragon 800 processors are currently sampling and expected to be available in commercial devices by mid-year 2013. The Qualcomm Snapdragon 600 processor targets high-end mobile devices. The Qualcomm Snapdragon 600 processor is designed to deliver great performance, rich graphics and enhanced user experience and will deliver up to 40 percent better performance than the Qualcomm Snapdragon S4 Pro processor at lower power. The new processor offers system-wide architectural improvements, key component upgrades and expanded connectivity options. The Qualcomm Snapdragon 600 processor features a new Krait 300 quad-core CPU with speeds up to 1.9GHz, a new speed enhanced Adreno 320 GPU and support for LPDDR3 memory. The Qualcomm Snapdragon 600 processor is sampling now and is expected to be available in commercial devices by second quarter 2013. For more information and to see a demonstration of the Qualcomm Snapdragon 800 processors, as well as the newest devices powered by Qualcomm Snapdragon processors, please visit Qualcomm during CES 2013 (South Hall 3, Upper Level, Booth #30313), Jan. 8-11 in Las Vegas or visit www.qualcomm.com/snapdragon.